Over the past several years, many growers have noticed an increasing incidence of deer feeding in young cotton. There are many theories as to why this may be occurring now relative to years prior. The most common theories involve the loss of aldicarb applied in-furrow for thrips and nematode control and major reductions and shifts in peanut acreage in the early-to-mid 2000s, resulting in the absence of preferred food sources for deer in some areas. Reports of deer feeding complaints in cotton have risen sharply in the last several years. These cases, however, are relatively isolated to fields that regularly encounter noticeably high numbers of deer and fields close to preferred deer bedding habitat. Deer appear to feed on young cotton (less than five to eight true leaves) until other preferred food sources become available. Feeding preference is primarily on the terminal bud (Figures 1A, 1B), which results in the loss of apical dominance. Thus, most of the harvestable bolls appear on multiple vegetative branches (Figures 1C, 1D) in deer damaged cotton. 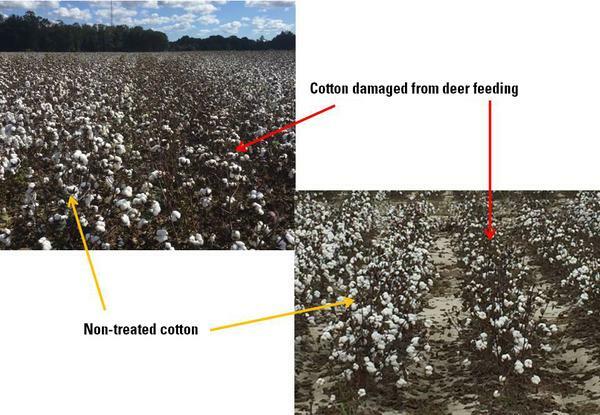 Preliminary observations suggest that deer feeding can cause severe stand loss and delayed maturity in cotton, and yield reductions in surviving plants. It is important to evaluate and quantify the effects of deer feeding on young cotton so that growers can make replant decisions in cases of significant stand loss or severe yield loss of surviving plants. Figure 1. Evidence of deer feeding on terminal buds (a, b) and the resulting loss of apical dominance (c, d). Illustrate the symptoms of deer feeding on young cotton. Help growers understand the impact of deer feeding on yield. Help growers evaluate stand loss resulting from deer feeding so that replant decisions can be made. Provide insight on managing fields affected by deer feeding. Figure 1 illustrates the common effects that deer feeding has on surviving young cotton after some time has elapsed. 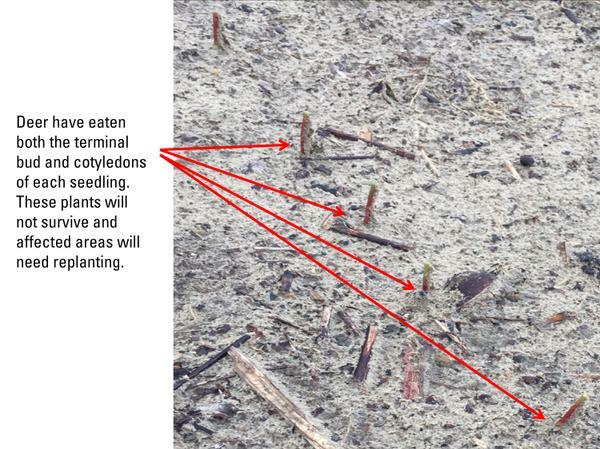 The top right photo (Figure 1B) shows where the terminal bud has been removed by deer, leaving only the cotyledons. So long as the cotyledons remain intact, they will provide an energy source to trigger the later development of new vegetative branches (Figure 1A) within a few weeks. These plants will most likely survive. Apical dominance, however, has been lost (Figures 1C, 1D). Therefore, growers can expect a severe delay in maturity of surviving plants and, in many cases, some degree of yield loss, depending on when deer feeding occurred. Figure 2 illustrates the effects of simulated deer feeding on cotton at both the two-to-three-leaf stage (Figure 2A) and the four-to-five-leaf stage (Figure 2B). When feeding occurs at the two-to-three-leaf stage (assuming deer didn’t feed below the cotyledons), the terminal bud has either been removed or is severely damaged. The cotyledon leaves have also been removed, but the cotyledonary petioles remain intact and will give rise to new vegetative branches at the junction of these petioles and the main stalk, assuming sunlight, soil moisture, and temperatures remain favorable. When feeding occurs at the four-to-five-leaf stage, the terminal bud is completely removed, but the entire cotyledons and some of the petioles for the first couple of true leaves remain intact, which will also give rise to new vegetative branches. In general, the more leaves that remain on plants that have been damaged by deer feeding, then the more likely and the sooner new vegetative branches will develop. However, when feeding occurs on larger plants, the crop maturity is delayed more than when feeding occurs on younger plants, simply because there is less time remaining in the season for new vegetative branches to develop bolls that will contribute to yield. Figure 3 illustrates a side-by-side comparison of deer feeding damage at various growth stages. The top row of photos illustrates the delay in maturity caused by deer feeding within a few weeks after the damage occurred and new vegetative branches are beginning to develop. The bottom row of photos illustrates the severity of these delays in maturity through the loss of apical dominance and lack of yield-contributing bolls that are important for maintaining yields. Figure 4 illustrates the effect of deer feeding on maturity and yield at the end of the season once all bolls are opened. In many cases, surviving plants that were affected by deer feeding have significantly fewer bolls or a few more late-maturing unharvestable bolls. Figure 2. Simulated deer feeding treatments on cotton: a. At two-to-three-leaf stage. b. At four-to-five-leaf stage. Figure 3. Effects of simulated deer feeding on cotton growth at various growth stages: a. No deer feeding. b. Simulated deer feeding on two-to-three-leaf cotton. c. Simulated deer feeding on four-to-five-leaf cotton. Figure 4. Delayed maturity and yield loss resulting from simulated deer feeding. Research conducted during 2016 and 2017 across North Carolina suggests that simulated deer feeding consistently resulted in a loss of apical dominance, altered growth, and delayed maturity of cotton across all environments. Simulated deer feeding resulted in significant seedcotton yield reductions in three out of five environments in both years of the evaluation (Table 1). Reductions in seedcotton yield appeared to be the result of fewer bolls per plant, delayed maturity as most harvestable bolls appeared on vegetative branches, and a lack of suitable time or growing degree day accumulation for post-injury recovery. Simulated deer feeding at the four-to-five-leaf stage resulted in greater losses of seedcotton yield compared to feeding that occurred at the two-to-three-leaf stage in four out of five environments. Reductions of seedcotton yields appeared to be greater when feeding occurred at the four-to-five-leaf stage due to lack of suitable time for adequate recovery and development of vegetative bolls needed to compensate for losses. This experiment did not investigate the effects of deer feeding when seedlings are killed and stand loss results, and this experiment also quantified yield losses when all plants (the entire planted area) were affected. This experiment also did not investigate the effects of continued feeding, but rather quantified the effects of feeding that occurred only once. Therefore, yield loss assessments and replanting decisions in growers' fields should be calculated on affected areas alone. 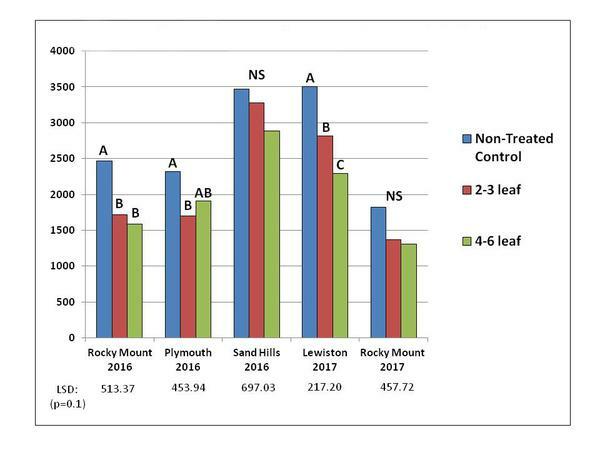 Seedcotton yield losses ranged from 20 to 30 percent (average of 26 percent yield loss) of the affected area when feeding occurred at the two-to-three-leaf stage. Seedcotton yield losses ranged from 18 to 36 percent (average of 29 percent yield loss) of the affected area when feeding occurred at the four-to-five-leaf stage. Although yield losses were generally less when feeding occurred at the two-to-three-leaf stage, this stage appeared to be more sensitive to seedling death as there is a greater risk that feeding could occur below the cotyledons. Although yield losses were generally greater when feeding occurred at the four-to-five-leaf stage, this stage appeared to be more resilient to seedling death as seedlings were more robust and feeding occurred consistently above the cotyledons. Table 1. Effects of Simulated Deer Feeding on Seed Cotton Yield (lb/acre). 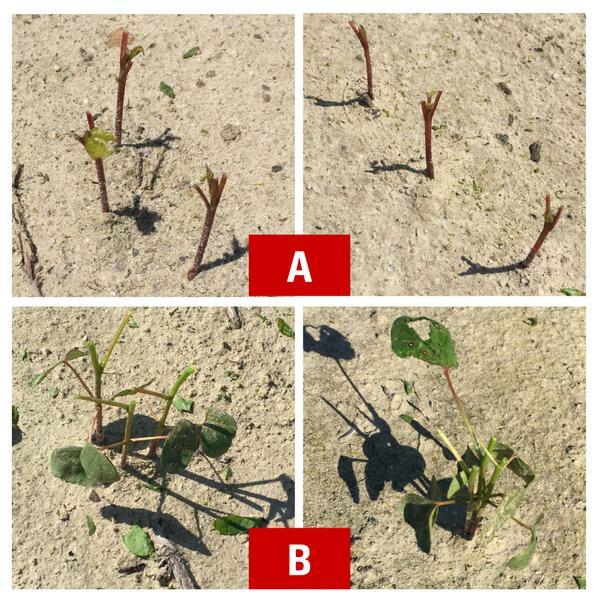 In many common cases, deer feeding occurs on young cotton (cotyledon cotton to two-leaf cotton) where seedlings are damaged below the cotyledons (Figure 5). In these cases, the terminal bud and all the growth-supporting plant tissue needed for new vegetative branches are lost, and these plants will soon die. If a significant area of a field is affected in this manner, replanting may be justified. Replanting decisions after deer feeding should be made similarly to such decisions after hail damage or poor emergence. If deer feeding has occurred below the cotyledons, consider that as a dead and lost seedling. In many cases, feeding in this manner more commonly occurs during the early part of the planting window when little to no other preferred food sources are available. Generally, the likelihood of this degree of damage decreases towards the end of the planting window. Exceptions seem to occur every year, however, primarily in areas where fields are small with high numbers of deer or where cotton is planted in close proximity to deer bedding areas. Thorough scouting of fields should occur soon after emergence and throughout the planting window. Growers shouldn’t wait until the planting season is over before evaluating fields so that replanting can be undertaken while there is still time. 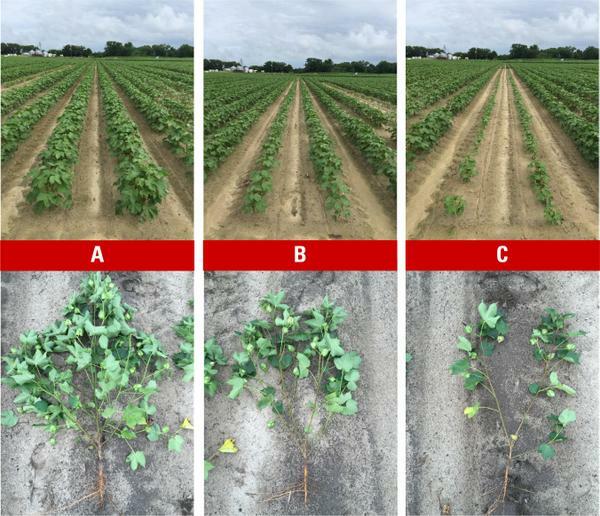 Ideally, feeding that kills cotton to this degree occurs primarily on field edges, so these areas can be treated and managed differently than the rest of the field. However, there have been cases where an entire field may be affected. A good general rule of thumb is that replanting can be justified when 50 percent of the planted area is occupied by skips of 3 feet or greater. Growers must then evaluate surviving plants and document planting date and growth stage when feeding occurred. Any potential yield loss of surviving plants must also be considered when making replanting and management decisions. Finally, growers should consider if soil moisture status is sufficient for replanting, the time remaining for replanting, and the likelihood that damage will occur again on replanted cotton. Figure 5. Effects of deer feeding on seedling cotton below the cotyledons. Deer have eaten both the terminal bud and cotyledons of each seedling. These plants will not survive and affected areas will need replanting. Ideally, areas of fields affected by deer feeding will be isolated to field edges or to particular areas within a field, although this isolation is commonly not the case. 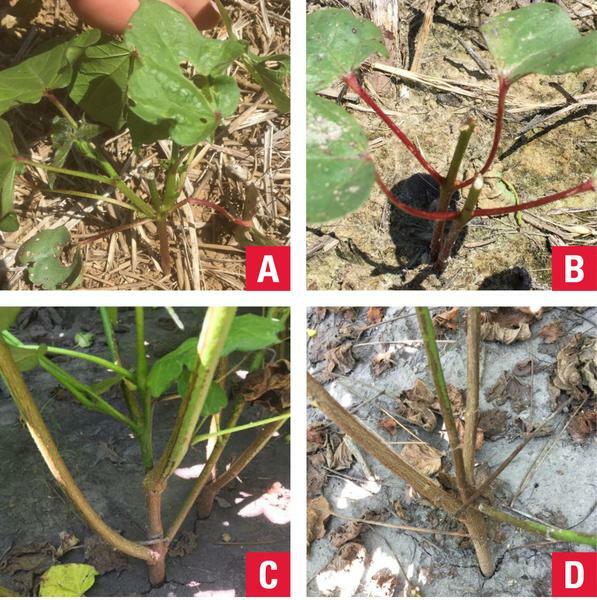 When cotton damaged by deer feeding is isolated to specific areas or edges, it is best to treat those parts of each field differently from the unaffected areas if replanting occurs in affected areas. Treat replanted areas similarly to very late planted fields. In replanted areas, it is very important to manage for earliness or maximizing retention of the earliest-set bolls. Replanted areas may be more heavily affected by losses due to insects. Therefore, thorough scouting and very timely insecticide application is necessary to retain early-set bolls. Replanted cotton may be more sensitive to fruit loss from drought, in which case timely irrigation could help. Lastly, using a different plant growth regulator (PGR) management strategy can help retain more early-set bolls in replanted areas. Growers may need to delay defoliation for as long as possible (a few days before first frost) in replanted areas to fully mature the entire boll population, which may require later harvesting than the rest of the field. For areas where plants survived but received damage from deer feeding, it is safe to assume that some yield loss has occurred and that maturity will be delayed. When growers hear that maturity is delayed, their first instinct is to apply PGRs aggressively to promote earliness. While this approach may be appropriate for replanted cotton in high-moisture soils, aggressive PGR application may not be appropriate for deer-damaged cotton. Although maturity has been delayed in surviving plants, it is important to understand that development is now behind schedule and extra time will be required to first initiate new vegetative branches and, second, to develop bolls on those vegetative branches. Therefore, growers should take action to encourage or stimulate growth for a good while after damage occurs—until we approach our last effective bloom date (typically August 20 to 31, depending on the year and location within North Carolina). There are no miracle or remedy products that have been researched for encouraging growth after deer feeding damage, and the best outcome will likely result from proper fertilization, adequate soil moisture, and good heat unit accumulation. While yield potential is likely to be lower in deer-damaged cotton, additional fertilization beyond soil test recommendations probably will not result in higher yields. Timely insect control and irrigation are also important in these situations. These management considerations should be shifted to reward a later-developing boll population for retention and development before the last effective bloom date. Furthermore, it is most important for growers to avoid practices that may further delay maturity or discourage growth throughout most of the summer months. This avoidance may include any practice that could cause injury or stunting to the crop, including herbicides and foliar fertilizers and aggressive PGRs early in the season. During early to mid-August, as the last effective bloom date approaches, PGRs could be applied to minimize additional growth beyond the last effective bloom date. Growers also may need to delay defoliation for as long as possible (a few days before first frost) in affected areas to fully mature the entire boll population, which may require harvesting these areas later than unaffected areas. For fields where stand loss was not significant enough to justify replanting and where a mix occurs of deer-damaged plants and normal plants, it is best to manage according to the majority of plants in that field, and especially according to the higher yielding areas of that field. This is a common scenario and is often complicated in terms of management decisions. It is generally recommended to delay the first PGR application until first bloom or mid-bloom, depending on planting date, to allow deer-damaged plants to somewhat develop their new vegetative branches. However, growers should not wait indefinitely where normal plants may be penalized from rank growth. This is a difficult decision and depends on the weather in dryland environments. In general, it is best to slightly delay the first PGR application (if nearly half of the field contains deer-damaged plants), use an overall moderate PGR strategy to prevent rank and unnecessary growth (more appropriate for early planted cotton), and slightly delay defoliation to provide more time for developing vegetative bolls on deer-damaged plants. Timely irrigation and insect management can also reward fields that fall into this scenario. In summary, deer feeding can frequently result in yield losses, delayed maturity, and complicated management of affected areas. Yield loss may be more severe if feeding occurs at later growth stages, while the likelihood of seedling death and stand loss increases at early growth stages. It is important for growers to evaluate affected areas of fields so that replant decisions, yield loss adjustments, and changes in management strategy can be made quickly. Thorough scouting soon after damage occurs, with adequate time remaining in the planting window, is the only sound strategy for making these decisions. Differential management for affected areas of fields may not prevent yield loss, but it could help minimize losses—depending on the timing and severity of deer feeding damage. The authors extend a special thanks to the NC Cotton Producers Association for their continued support of this and other agronomic research for cotton at NC State University.